Everyone loves pierogies—but have you tried sweet pierogies? Despite the fact that I’m not Polish and hadn’t visited the country until my late 20s, I’ve long been a fan of the country’s signature dumplings. What further proof do you need to prove Poland is a country of carb-loading geniuses than pierogies? Poles literally took a handful of potatoes, asked themselves how they could make it heavier, and then shoved them inside pasta. Sometimes, the results are even fried—because, to bastardize the famous Ben Franklin quote about beer, Polish food is proof God wants us to be happy. Fruit- and sweet cream-laced pierogies are the star of this tradition. Yes, they really do taste like pasta combined with sugar and fruit. Blueberries and strawberries are the usual suspects—although a variety filled with farmers’ cheese recalls a very light cheesecake-esque texture. As far as base appeal goes, it’s a strong meeting of worlds: Starchy and sweet, this is essentially two comfort foods in one dish. At a recent party, my friend’s mother (Hanna Marszałek, a name I mention only because having tasted her food I’m actively researching adult adoption) made cherry pierogies at my request. We ate them in happy silence, slicing through the thin dough with forks and mixing the juice with unsweetened sour cream. 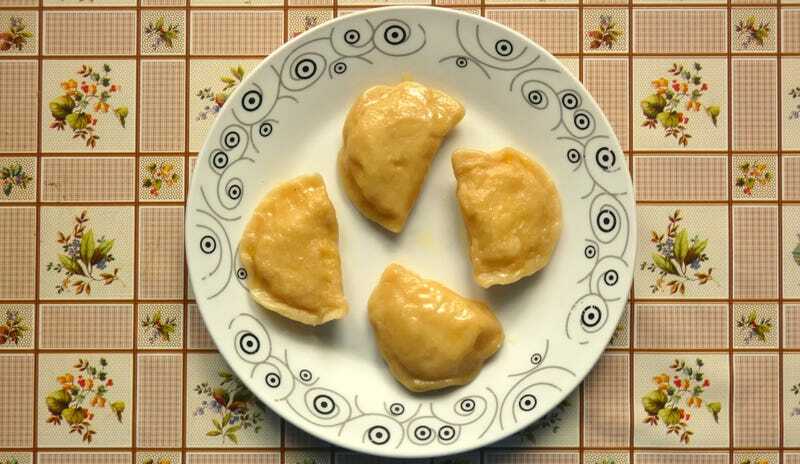 But despite a near-universal fondness for the stuff, few Poles can name sweet pierogies’ origin story. Although there are stories of homemade versions, usually compiled by mothers and grandmothers in triple-digit batches, there are no histories, no myths, and no origin stories—a unique exception to the story-rich Polish culture. Anna Mejer, a pierogi-class instructor at Eat Polska Food & Vodka Tours in Warsaw, Krakow, and Gdansk, has a few theories. But as an academic, she’s careful to emphasize that all she has are hypotheses. Firstly, her people like carbs. (“In Poland you’re never more than three hours away from your next portion of gluten,” she says.) They also have a sweet tooth, thanks in no small part to the country’s heavy production of sugar beets. But perhaps most importantly, who doesn’t like a deal? It’s a statement that only highlights the true beauty of Polish food. Somehow, created through an act of practicality, sweet pierogies, equal parts sugary and savory, has become the “why not both?” response for anyone looking for a bit of culinary comfort. Because sometimes in Poland it simply isn’t enough to be happy—you’ve got to be stuffed as well. Digital nomad and freelance writer. Not hip. Likes ketchup and pie. Great, now we have nothing left to discuss on the second date.